Does the thought of writing anything by hand make you want to run and hide? Are you tired of searching all over the inter webs for invitations? Do you get overwhelmed by TOO MANY options but still want something that looks like YOU? We got you Boo!! We’re Meredith + Genina, and if you can relate, you are definitely in the right place. So, grab your hot mug of coffee (or glass of champagne) and take a look around. We think you’ll be able to find just what you’re looking for. Whether you need envelopes addressed, place cards written, or a custom sign for your bestie’s housewarming gift, we’ve got you covered! 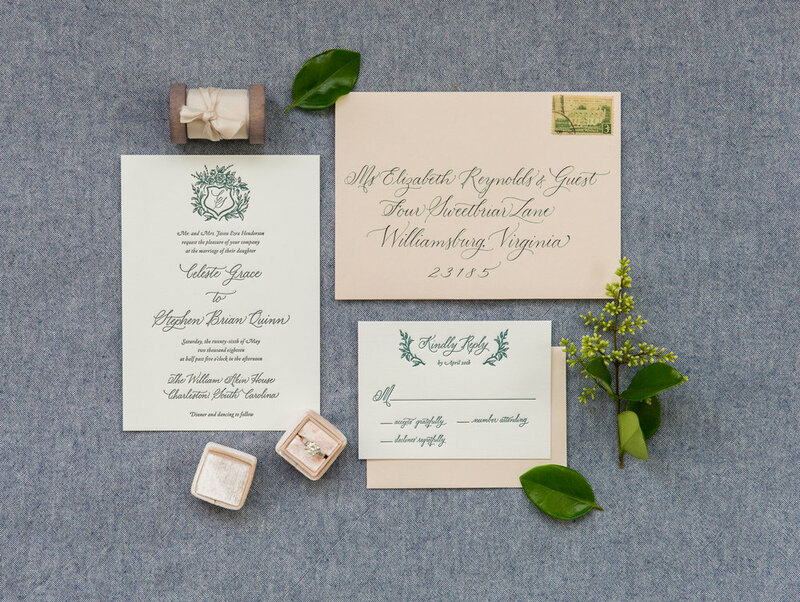 Our collection of semi-custom invitation suites embody the essence of Lowcountry Paper Co. – thoughtful design, handwritten calligraphy and whimsical illustrations. We created this collection for you, because we understand your need for beauty and simplicity. We love paper…like, a lot…which is why we specialize in paper design. If you’re looking for something personalized just for you but you’re not sure where to start, that’s where we come in. We hope you enjoy our cozy little corner of the internet. The Ladies of Lowcountry Paper Co.
Are you looking for something more custom than what you see in our Collection? No problem! We love creating custom designs, so let’s chat!